The goal of Cultivating Success™ is to create and implement educational programs to increase the number and foster the success of sustainable small acreage farmers and ranchers. The WSU Food System’s, Cultivating Success™ Program consists of three courses, Is a Small Farm in Your Future?, Whole Farm Planning and Agricultural Entrepreneurship, and an On-Farm Internship Program. The goal of these educational opportunities is to provide beginning and existing farmers with the planning and decision-making tools, production skills, and support necessary to develop a sustainable farm or food business. Cultivating Success™ connects the student with farmers and exposes them to real world situations through a community-based, experiential approach. Whether you are a community member wanting to learn how to plan your farm business, or an experienced farmer/rancher wanting to try something new – Cultivating Success™ provides educational opportunities for anyone interested in the knowledge and skills you need to be successful in your food or farm business! The three courses, Is a Small Farm in Your Future?, Whole Farm Planning and Agricultural Entrepreneurship courses are offered in various locations around Washington to audiences that include new and experienced farmers, academic students, immigrant farmers, and agricultural professionals. See if there’s a course coming up near you! You can also find out more about the Cultivating Success™ Idaho program by visiting cultivatingsuccess.org. 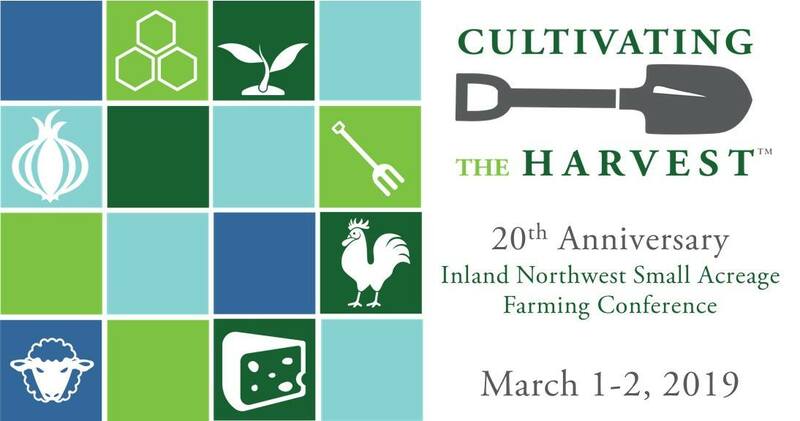 Cultivating the Harvest: 20th Anniversary Inland NW Small Acreage Farming Conference (1999 – 2019) is happening March 1st and 2nd. Friday includes tours and workshops as well as a welcome receptions and registration includes a ticket to the Friday performance of Map of My Kingdom: https://momk-moscow.eventbrite.com. Saturday will focus on unlocking the power of on-farm research, and morning sessions on small farm marketing, farm profits, insects & pollinators, and soils. Our afternoon will begin with a farmer-to-farmer panel that leads into specialized farmer-to-farmer discussions.